The song I Am Woman says a lot about the strength of this gender. But what emotional and physical price do many women pay to do all the wonderful things that the song acknowledges and which very often men depend? Client X has symptoms of fatigue, insomnia, weight gain , headaches and a series of minor illnesses. She denies being under stress and requests an antidepressant. A traditional allopathic physician would probably prescribe one. After all, she exhibits the classic symptoms of depression. An holistic physician would not take, “No I’m not under stress,” at face value. We can better evaluate the cause of her symptoms when we take the time to listen to a client and learn something about how they live, and the challenges they face. Does she have all the above symptoms because of years of taking care of children, a husband, a job, and not getting much recognition? Is this an all-too-common “Superwoman” putting in 25-hour days and trying to lighten the load for everyone else? We may find she is dealing with the threat of unemployment, or a recalcitrant teenage child on drugs, or a parent with Alzheimer’ disease. The patient may have been living with all or some of these for some time and may not consider them particularly stressful – “It is my job.” But whether or not they are “normal,” these kinds of stresses do have an effect on the body’s system. The body reacts with the Acute Stress Response (ASR) but now it has become the Continuous Stress Response (CSR). Both put out the same adrenal hormones and cancel the non-essential functions for flight or fight. 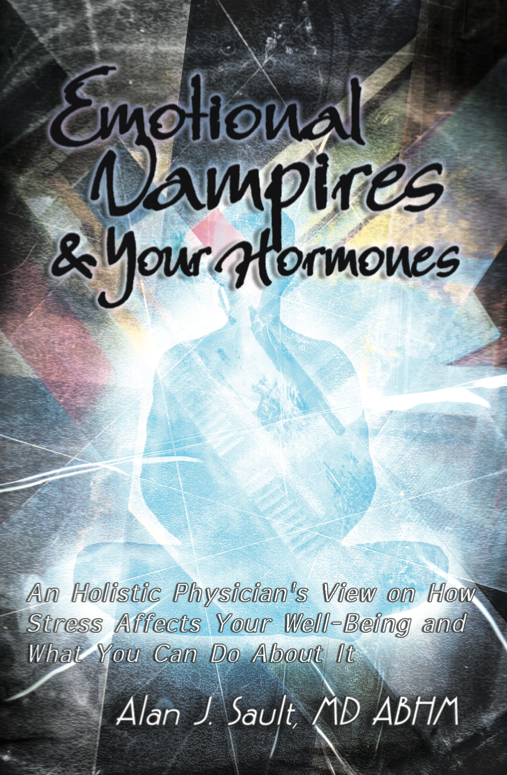 (see book: Emotional Vampires and Your Hormones……) The CSR causes many diseases due to the hormonal imbalance. All of our endocrine (hormone) system is interconnected. If one of our hormones, for example serotonin, is “out of whack,” then probably other hormones- in trying to compensate so that the body will be in homeostasis – have also reached compensatory dysfunction. For example, Patient X may do well on restoring her serotonin levels (preferably naturally), but because of the long-term stress and lack of sleep she may also have Adrenal Fatigue Syndrome. The adrenals put out many of our hormones, especially in stressful situations. Cortisol, for example, is produced in higher levels during periods of stress to help the situation (reacting as if in fight or fight) but eventually can be depleted (Emotional Vampires and Your Hormones: an holistic physician’s view of how stress affects your well-being and what you can do about it. Holistiacsecondopinion.net/vampires). Then, because more glucose is needed to provide more energy to the cells to support the increased metabolic rate during continuous stressful situations, we get the involvement that an holistic physician would consider and discuss with the patient. If a diagnosis of depression is made there are many options. It may be appropriate to refer this client to counseling. If she is the caregiver and problem solver and general fix-everything person in the family, she may benefit from having someone simply listen to her and give her their full attention. Perhaps she has a problem saying “no” and could benefit from some assertiveness training: or perhaps she has never considered that self nurture, can be nurturing everybody; it is not selfish but necessary. Counseling has been shown to be as effective as the SSRIs for mild to moderate depression and anxiety. So has exercise, which also has many other obvious benefits. Part of the benefit is that taking the time to exercise means taking the time for self-care. It also provides an outlet to be in a different social environment and interfacing with other people. Patient X can learn to take care of herself by learning how to better cope with stress, or by working through emotional challenges, and by taking the time for self nurture. In so doing, she has a good chance of not having to take medicines, whether they are prescription or botanicals. Either of the latter are reality only alleviating the depression and not curing the source. Until a person comes to a conclusion of how to deal with stress and also that they deserve to have self-nurture they will not be able to create the vibrant health that they deserve. When a client says to me that they do not have time for self-nurture I make them listen to what they just told me and explaining that they are sending a subconscious message that the kids, husband, boss,etc are worth her time but she is not worth at least 30 minutes per day. Take time to nurture all aspects of your being: physical, Emotional, mental and spiritual. A joy-filled life is Your birthright : CLAIM IT!!! This entry was posted in Adrenal Fatigue, Stress, Superwomen, Women and stress and tagged Cortisol-its importance on July 1, 2015 by Alan Sault MD, ABHM.